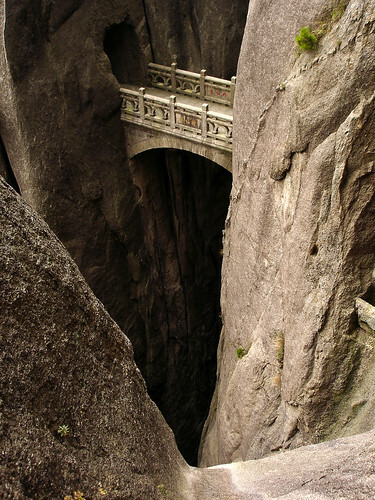 This fantastic looking small, dizzyingly high, pedestrian bridge spanning a very narrow and deep sheer divide between two rock faces is the Buxian Bridge, popularly known as Fairy Walking Bridge. 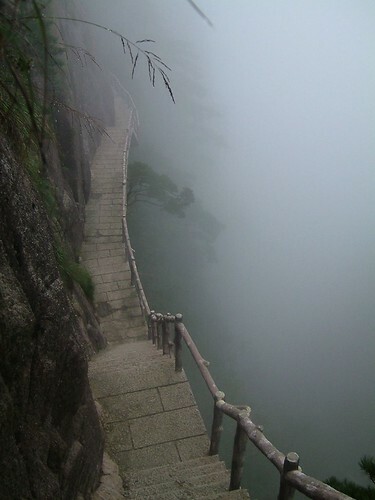 Built in 1987 it is part of mountain hiking trail in Xihai Grand Canyon, Huangshan, China aka Mt. 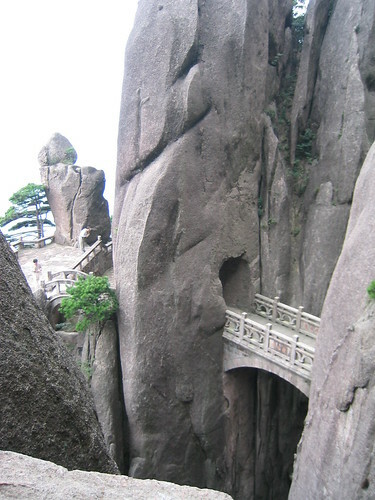 Huang (meaning: Yellow Mountain). Xihai (meaning: West Sea) derives its name due to high peaks in the region which rise above the clouds giving an impression of sea. 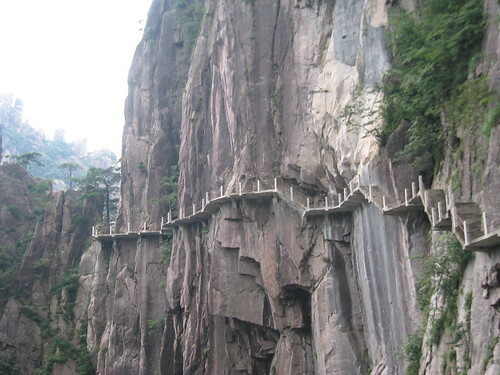 The entire hiking route which stretches for about 10 kilometres is very scenic and has unusual rock formations. No wonder it is called "Magic Scenic Area". 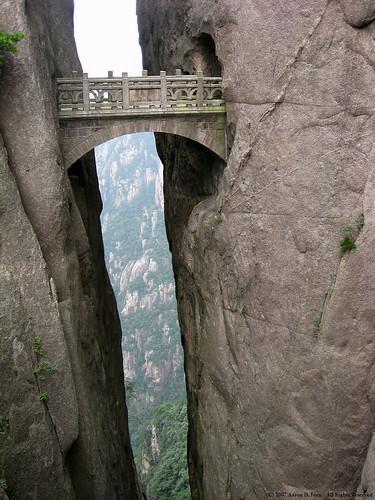 Fairy Bridge is a very popular tourist attraction. 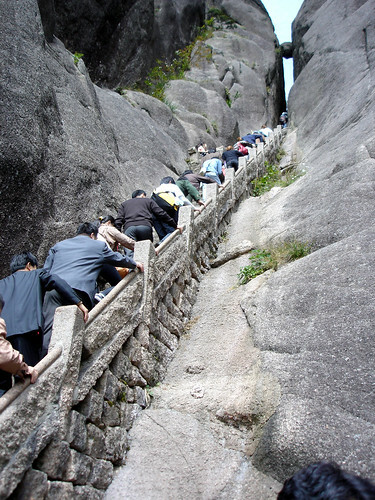 The northern route which was opened in 2001 has also become very popular with hikers/tourists. 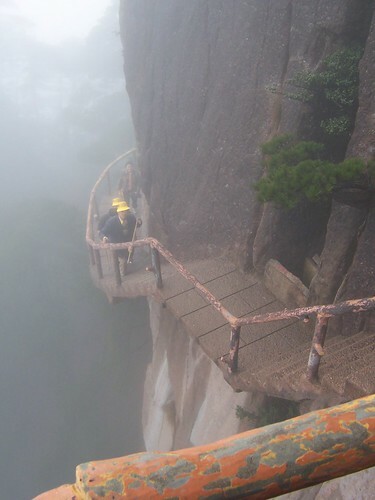 Note: It was not possible to ascertain the actual spot of the Fairy walking Bridge or the hiking trail. The location therefore shows the general area.